1 – More volunteers are working on conservation in Michigan. Next year will be the biggest yet for the Huron Pines Americorps program. Huron Pines, a nonprofit in Gaylord, has 23 Americorps members signed up. They’ll be placed around Michigan with host sites in Gaylord, Traverse City, Grayling, Alpena, Marquette, Gladwin, Oscoda, Petoskey, Lake City and Midland. AmeriCorps members are college graduates who apply to be placed with grassroots nonprofits and agencies. For the past eight years, Huron Pines AmeriCorps members have stabilized eroding streambanks, replanted trees, helped control invasive plants, improved wildlife habitat and expanded access to recreation. Applications are still being accepted through Oct. 26, to begin serving in January 2016. 2 – Michigan Agency for Energy is the first energy agency in the nation to make improvements using Property Assessed Clean Energy financing, also known as PACE. 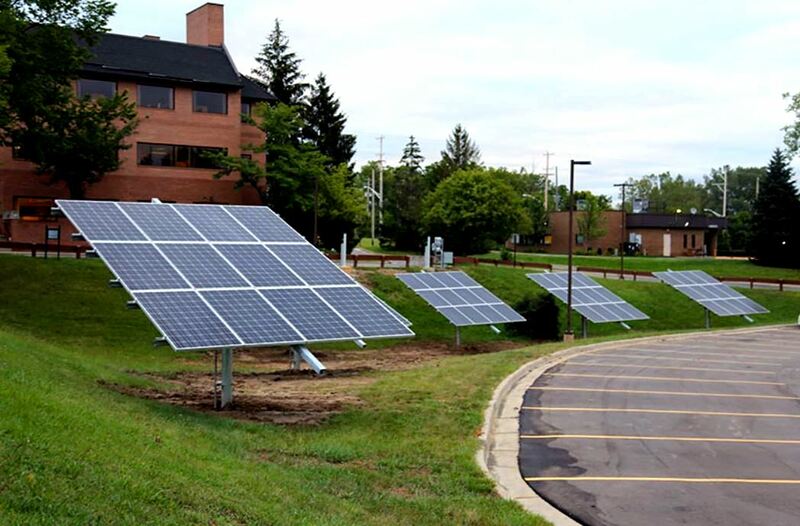 Taxpayers are expected to save $800,000 due to energy efficiency improvements including solar panels at the agency’s Lansing offices. The improvements, which cost about $437,000 to install, include LED lights, occupancy light sensors, roof insulation, electric vehicle charging stations, and variable speed motors for heating and cooling. Under PACE, energy efficiency projects are financed through property tax payments rather than regular bank loan payments. 3 – Saginaw Bay is stressed out. Parts of the bay are looking stressed in updated maps from the GLEAM project, which stands for Great Lakes Environmental Assessment and Mapping. University of Michigan researchers and colleagues have created detailed maps of five recreational activities in the Great Lakes: sport fishing, recreational boating, birding, beach use and park visits. They say the information can be used to help prioritize restoration projects. A map of recreational use and stress shows high recreation and high stress on parts of inner Saginaw Bay. The Thumb area shows high recreation and low stress. A paper summarizing the study’s findings was published this month in a journal of the Ecological Society of America.